Providing you the best range of visual ir thermometer, infrared gun and thermo hygrometer with effective & timely delivery. Measure with confidence: Because traditional infrared thermometers only measure an average area, it is often impossible to accurately identify what you are actually measuring; with the Fluke VT02 Visual Thermometer you get the visual image of exactly what you are measuring. Detect issues instantaneously: Lose the pen, paper, and clipboard, the Fluke VT02 saves a blended infrared and visual image with every image capture instantly! In one blended picture your customers get the complete picture and can compare readings from different dates which saves them valuable time and ultimately money. 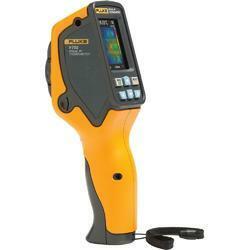 The Fluke VT02 has a Near/Far feature that is not available on other products. The Near/Far is exclusive to Fluke Visual IR Thermometers and allows the user to take simultaneous visual images with the thermal heat map images that are accurately aligned close in, ≤ 23 cm ( 9 in), with the Near feature, as well as beyond with the FAR feature. No other product can boast this Near visual and thermal heat map alignment feature that allows you to get close-in and document the exact location of the issue. 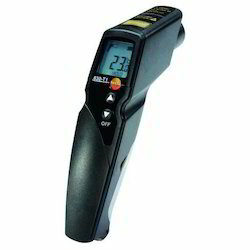 Infrared Gun 830-T1 infrared temperature gun allows efficient, non-contact surface temperature measurements to be carried out. The infrared temperature thermometer will leave you well equipped, especially for control readings in trade and industry: The gun-style design is easy to handle and the integrated processor provides accurate measurement results. For infrared temperature gun, the emission level can be individually set. This allows you to adjust it precisely to the surface of the material being measured, to achieve the best possible measurement results. For untreated surfaces with a low emission level, we recommend using an emission tape (optional) which makes the IR temperature measurement significantly easier. In line with clients' diverse requirements, we are involved in providing an optimum quality range of Thermo Hygrometer. The thermal hygrometer has an NTC temperature probe which performs very precise temperature measurements and a capacitive humidity sensor which is characterized by its long-term stability. 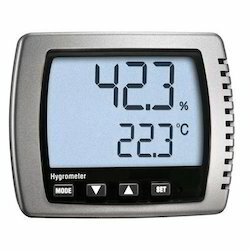 This makes this thermohygrometer a reliable and durable partner for recording the indoor climate. You can, therefore, use the measuring instrument in locations such as offices, warehouses, laboratories, garden centers or living areas to determine temperature, humidity and dew point. The hanging and standing brackets enable you to either hang the thermohygrometer on the wall or to place on a table or a shelf. Looking for Digital Thermometer ?